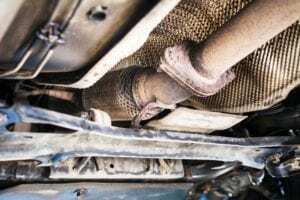 The catalytic converter is a very important part of the emissions control system on your vehicle. It’s usually good for the life of a vehicle, but occasionally it does fail. Our technicians will put your vehicle on an electronic diagnostic machine to locate the source of the problem, possibly remove the oxygen sensor from the exhaust manifold or exhaust pipe ahead of the catalytic converter to see if that changes things and replace the catalytic converter, if necessary.